Days of Palestinian demonstrations against the high cost of living turned violent in a West Bank city on Monday as protesters smashed windows and attempted to storm a municipality building before clashing with police. In Hebron, police beat some demonstrators and hurled tear gas to disperse the crowd. The violence calmed down after about an hour, and there were no reports of injuries. Elsewhere in the West Bank, demonstrators halted traffic with burning tires, schools were closed and storeowners shuttered their shops. It was the most serious unrest since the demonstrations erupted last week. A growing number of people have taken to the streets in anger over rising prices and the government’s inability to pay full salaries to tens of thousands of civil servants. The rallies are the largest show of popular discontent with the governing Palestinian Authority in its 18-year history. There have been large demonstrations against Israel, which wields overall control of the West Bank, but there has never been anything so wide-scale directed against the Palestinian autonomy government. The large Palestinian protests and the police’s tough response have been faintly reminiscent of the mass demonstrations of the Arab Spring that topped aging dictatorships in Tunisia, Egypt, Libya and Yemen, and sparked civil war in Syria. 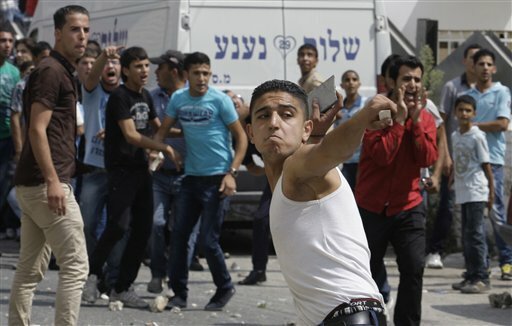 For the time being, however, there is no sign that the Palestinian unrest is approaching that level. Much of the rage is directed at Palestinian Prime Minister Salam Fayyad, a U.S.-educated economist who oversees the government’s finances. Fayyad says the troubles are beyond his control. The Palestinian Authority, which governs parts of the West Bank, is grappling with a sharp budgetary shortfall because the U.S. and Arab countries that sustain it haven’t delivered promised aid money. The authority, by far the largest employer in the West Bank, hasn’t been able to pay full salaries in months. As he spoke, youths hollered and cheered as they set tires on fire behind him, sending plumes of black smoke into the air and blocking the main road from the West Bank city of Ramallah to Jerusalem. Nearby, striking taxi and bus drivers painted the word “taxi” in yellow on a donkey. The strikes engulfed all large Palestinian urban centers of the West Bank, from Jenin in the north to Hebron in the south. Public transport drivers blocked roads, youths burned tires and some shops closed their doors. Others also demanded government subsidies for basic goods like food and fuel, a minimum wage, the repeal of a recent round of tax hikes and the cancellation of a Palestinian trade agreement with Israel. Monday’s protests followed a series of small but growing strikes over the past few weeks. The money that the Palestinians say has not been delivered includes $200 million from the U.S. in budget support that is being held up by Congress. The Palestinians say the United Arab Emirates cut aid from $174 million in 2009 to $42.5 million since the beginning of 2011 in an attempt to pressure Palestinian president Mahmoud Abbas to reinstate a disgraced former aide. And Qatar, another rich Arab state, has linked aid to elusive reconciliation between Abbas and the Gaza Strip’s Hamas rulers. The annual budget is set at nearly $4 billion, with half of that intended to pay 154,000 civil servants, said economist Samir Abdullah, a former Cabinet minister. Government salaries are the backbone of the Palestinian economy in the West Bank. Donor dollars are crucial because Palestinians have an economy hampered by Israel’s control over the West Bank’s borders as well as limited movement inside the territory. Security checks over exports and imports hamper the ability of Palestinian manufacturers to buy cheaper products elsewhere and raise the price of exports. Associated Press writers Nasser Shiyoukhi in Hebron, Mohammed Ballas in Jenin, and Ibrahim Barzak in Gaza City contributed to this report. Follow Hadid on twitter.com/diaahadid.